The Arctic remains a region where Russia and the West get along. Should that change, both sides would likely be to blame, according to Denmark’s external intelligence agency. In the coming year, Danish security experts will be most concerned with Russian attempts to disrupt a planned general election through a similar pattern seen in other Western countries in recent years. Although a discussion of the potential for conflict in the Arctic with Russia features prominently in Denmark’s 2018 national threat assessment, released on Tuesday, its author, the FE, the external intelligence agency, concludes that countries in the region remain committed to keeping their relations isolated from disputes elsewhere in the world. “The trend in the Arctic region has generally been characterized by cooperation amongst the Arctic coastal states, particularly when it comes to regional issues, such as establishing national borders, the environment, search and rescue, indigenous peoples and fisheries,” the FE writes. But while a continued atmosphere of collaboration in the Arctic makes the region less of a concern for Denmark than the specter of fake news, a terrorist attack or Russian shenanigans in the Baltic Sea, the FE finds that the ongoing militarization in and around the region, as well as China’s growing polar ambitions, can pose a potential security challenge. The FE, for example, notes that while Arctic coastal states — Canada, Denmark (on account of Greenland), Norway, Russia and the U.S. — remain committed to the 2008 Ilulissat Declaration, in which they pledged to seek to resolve disagreements in the region through peaceful means, a rise in military activity in the region could touch off an arms race. 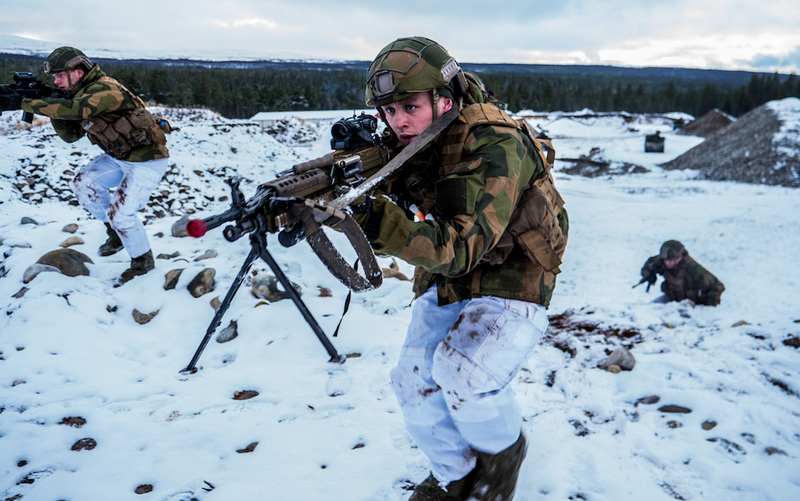 Although not named specifically, the description matches NATO’s Trident Juncture exercise, held this autumn in Norway and billed as the largest military exercise of the post-Cold War era. Most of the activity took place in the central part of the country, and no adversary was named, but the exercise involved 28 NATO countries as well as non-NATO Sweden and Finland, and it was clear that the purpose was to send a signal to Moscow that after more than a decade of operations in Afghanistan and Iraq, the alliance was still capable of mounting operations on its northern flank. The FE found that activities such as these — both in and adjacent to the Arctic, and whether held by NATO or by Russia — were a potential threat to the stability of the region. When it comes to China, the FE remained guardedly optimistic about what it sees as the country’s “legitimate,” and potentially beneficial interest in the region. It points out, for example, that while there are more Chinese scientists and businesses active in the Arctic, Beijing’s military presence there has, to date, been limited. Chinese firms are active investors in a number of potential mining operations in Greenland, and, in 2016, carried out an upgrade of an undersea telecoms cable. While these have been deemed unproblematic, the FE cautions that China’s commercial and scientific communities are closely intertwined with the political system and may reflect its efforts to gain influence in the Arctic. In Greenland, such investments constitute a “particular risk,” if it their size is disproportionate with the country’s economy or its population of just 56,000. The FE further warns that should Chinese firms make investments in resources Beijing deems strategic, it is likely that Beijing would seek to influence the decision-making process. The warning echoes events of recent years in which Copenhagen — likely at the behest of Washington — blocked investment in infrastructure projects there. First in 2016, when it suddenly decided to reactivate a naval base that was on the verge of being sold to a Chinese mining outfit. In September, Danish investment in Greenlandic airport construction eliminated the need for Nuuk to continue considering a bid submitted by a Chinese contractor.